Tumbbad aka Tumbad is a 2018 Bollywood mythological-drama, helmed by Rahi Anil Barve. The movie stars Sohum Shah, Harish Khannaa, Anita Date, etc., in lead roles. The movie revolves around the life of three generations in a Brahmin family. 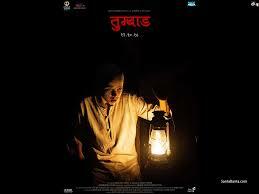 Tumbbad is an imaginary village, near Pune. The first teaser of Tumbbad came with a tagline 'A Tale Of Greed Beyond Fear'.